Hello Folks! If you're an avid reader of my blog, you must have noticed that we're now under a domain name of purpleplumfairy.com and no longer under the free Blogger platform. I sincerely thank my two blogger friends for making them possible; my blog contributor, Norma Galera and fellow foodie Dems Angeles of www.demsangeles.com. And as a way to celebrate my new domain name, allow me to share another giveaway! Woot! These are simple surprises, but nevertheless, my way of sharing blessings. 1. Follow Purple Plum Fairy via Google Friend Connect. 5. Comment on this post with your name, FB name, IG name and email address. Contest duration is from October 9 to October 14, 2014. We will raffle all your names and will be picking two winners. One winner will win a gift certificate from Spa in the City (may be used for any service that he/she desires, i.e. Body massage, facial, mani + pedi, hairspa etc.) 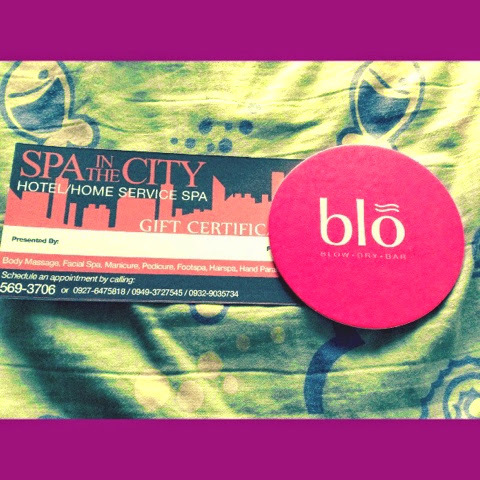 and another winner for the Blo Blow Dry Bar Deep Conditioning Treatment at Blo Serendra. Winners must be willing to claim their prizes in Trinoma Mall on October 18 at 10AM. Winners will be notified through email.